When beginning a new software development project, Waterfall and Agile development lifecycles are the two different methodologies that should commend equal amount of consideration. 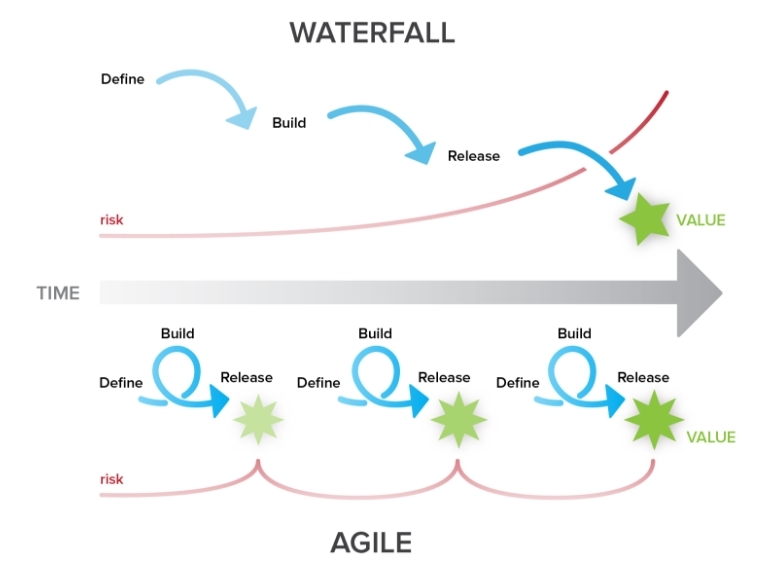 Waterfall is the more traditional of the two methodologies with stricter process steps, while Agile is more adaptive and allows for flexibility during the development process. Is considered a rigid process of development. Usually consists of one project that is divided into multiple phases. Each phase progresses through a “cycle” (requirements, design, implementation, verification and maintenance) only once throughout the overall development cycle. Software testing occurs after the implementation of the design is executed. Customer feedback is important but usually only takes place during the maintenance phase when the “user reviews” of the software are available. Is considered a more flexible process of development. There are several simultaneous projects, which consist of iterations of different phases of the software development based on customer and stakeholder feedback, as well as reports from the QA (quality assurance) team. Because of the iterations, some of the phases in Agile (requirements, development, testing and delivery) will appear more than once throughout the development cycle. Software testing is done simultaneously during the development and programming phases. Agile depends on the customer feedback because it is implemented into the next iteration and continually improves the development of the software. Both methodologies are valuable however each of them may be better suited for certain types of projects. The Waterfall model is a strict process of phases and is generally best suited for projects that a) have clearly defined development requirements and b) have a minimal chance of changing in the testing stage. The Agile model is a more flexible and collaborative process because it allows for the requirements to evolve as the development progresses. When considering which software development process is best to use in your next project, keep these differences in mind.